consistently from one still to the next. Label the double points and the optima and read the labels as they are encountered upon a single journey around the curve. The labels, too, are chosen consistently from one still to the next. Write these down for each curve in a movie, and connect the letters in the words as the curves change according to the basic changes that occur in each of the movie scenes. These curves then are instructions on how to immerse the ambient sphere to create the illustrations. Sarah’s thesis computes that the fold set is an annulus, the double point set is the connected sum of three projective planes, and the double decker set is the connected orientation double cover: a genus 2 surface. There’s a glitch in part 4, so I’ll post that as soon as I can. I’ve mentioned Outside In before. That video shows a way of turning a sphere inside out. It’s simpler than the first explicit eversions to be discovered, but the simplicity is connected to a high degree of symmetry. This leads to very congested parts of the movie, where it’s very difficult to see what’s going on. Further, many quadruple points — where four sections of the surface pass through the same point — occur simultaneously, and even higher degree points occur. We need a simpler version. What would constitute “simple” for us, then? We want as few multiple points as possible, and as few at a time as possible. In fact, it would be really nice if we could write it down algebraically, in some sense? But what sense? Go back to the diagrammatics of braided monoidal categories with duals. 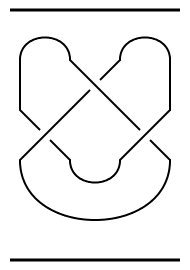 There we could draw knots and links to represent morphisms from the monoidal identity object to itself. And topologically deformed versions of the same knot encoded the same morphism. This is the basic idea of the category of tangles. But if we shift our perspective a bit, we consider the 2-category of tangles. Instead of saying that deformations are “the same” tangle, we consider explicit 2-isomorphisms between tangles. 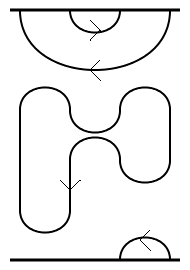 We’ve got basic 2-isomorphisms for each of the Reidemeister moves, and a couple to create or cancel caps and cups in pairs (duality) and to pull crossings past caps or cups (naturality). Just like we can write out any link diagram in terms of a small finite collection of basic tangles, we can write out any link diagram isotopy in terms of a small finite collection of basic moves. What does a link diagram isotopy describe? Links (in our picture) are described by collections of points moving around in the plane. As we stack up pictures of these planes the points trace out a link. So now we’ve got links moving around in space. As we stack up pictures of these spaces, the links trace out linked surfaces in four-dimensional space. And we can describe any such surface in terms of a small collection of basic 2-morphisms in the braided monoidal 2-category of 2-tangles. These are analogous to the basic cups, caps, and crossings for tangles. Of course the natural next step is to consider how to deform 2-tangles into each other. And we again have a small collection of basic 3-morphisms that can be used to describe any morphisms of 2-tangles. These are analogous to the Reidemeister moves. Any deformation of a surface (which is written in terms of the basic 2-morphisms) can be written out in terms of these basic 3-morphisms. We can simplify our picture a bit. Instead of knotting surfaces in four-dimensional space, let’s just let them intersect each other in three-dimensional space. To do this, we need to use a symmetric monoidal 3-category with duals, since there’s no distinction between two types of crossings. And now we come back to eversions. We write the sphere as a 2-dimensional cup followed by a 2-dimensional cap. Since we have duals, we can consider one side to be “painted red” and one side “painted blue”. One way of writing the sphere has the outside painted red and the other side is painted blue. An eversion in our language will be an explicit list of 3-morphisms that run from one of these spheres to the other. Scott Carter and Sarah Gelsinger have now created just such an explicit list of directions to evert a sphere. And, what’s more, they’ve rendered pictures of it! Here, for the first time in public, is a 50MB PDF file showing the Carter-Gelsinger eversion. First they illustrate the basic pieces of a diagram of knotted surfaces (pp. 1-4). Then they illustrate the basic 2-morphisms that build up surfaces (pp. 5-6), and write out a torus as an example (p. 7). Then come a few more basic 2-morphisms that involve self-intersections (pp. 8-9) and a more complicated immersed sphere (pp. 10-11). Each of these is written out also as a “movie” of self-intersecting loops in the plane. Next come the “movie moves” — the 3-morphisms connecting the 2-morphism “movies” (pp. 12-17). These are the basic pieces that let us move from one immersed surface to another. Finally, the eversion itself, consisting of the next 79 pages. Each one consists of an immersed sphere, rendered in a number of different ways. On the left is a movie of immersed plane curves. On the top are three views of the sphere as a whole — a “solid” view on the right, a sketch of the double-point curves in the middle, and a “see-through” view on the left. The largest picture on each page is a more schematic view I don’t want to say too much about. The important thing to see here is that between each two frames of this movie is exactly one movie move. Everything here is rendered into pictures, but we could write out the movie on each page as a sequence of 2-morphisms form the top of the page to the bottom. Then moving from one page to the next we trace out a sequence of 3-morphisms, writing out the eversion explicitly in terms of the basic 3-morphisms. As an added bonus, there’s only ever one quadruple point — where we pass from Red 26 to Blue 53 — and no higher degree points. I’d like to thank Scott for not only finishing off this rendering he’s been promising for ages, but for allowing me to host its premiere weblog appearance. I, for one, am looking forward to the book, although I’m not sure this one will be better than the movie. [UPDATE] Some people have been having trouble with the whole 50MB PDF (and more people might as the Carnival comes to see this page. Scott Carter broke the file up into five pieces, and I’ve put them up here in a new post. There’s a glitch in part 4, but I’ll have that one up as soon as I can. About half the paper consists of setting up definitions of a mosaic and the Reidemeister moves. This concludes with the conjecture that before you allow superpositions the mosaic framework captures all of knot theory. The grading by the size of the mosaic leads to an obvious conjecture: there exist mosaic knots which are mosaic equivalent, but which require arbitrarily many expansions. This is analogous to the same fact about crossing numbers. Obviously, I’d write these combinatorial frameworks as categories with the mosaics as objects and the morphisms generated by the mosaic moves. Superpositions just seem to be the usual passage from a set to the vector space on that basis. See my new paper for how I say this for regular knots and Reidemeister moves. Then (like I say in the paper) we want to talk about mosaic “covariants”. I think this ends up giving your notion of invariant after we decategorify (identify isomorphic outputs). The only thing I’m wondering about (stopping shy of saying you two are “wrong”) is the quantum moves. The natural thing would be to go from the “group” (really its a groupoid like I said before) of moves to its linearization. That is, we should allow the “sum” of two moves as a move. This splits a basis mosaic input into a superposition. In particular, the “surprising” result you state that one quantum mosaic is not quantum equivalent to the other must be altered. There is clearly a move in my view taking the left to the right. “Equivalence” is then the statement that two quantum mosaics are connected by an *invertible* move. I’m not sure that the move from left to right is invertible yet, but I think it is. Long-time readers may remember that back in September I went to a conference at the University of Texas at Tyler. Well, it turns out that the AMS wants to publish a proceedings of the conference. So I’m trying to throw together a paper on the stuff I was talking about. As I’m doing so, I’m recognizing that one part of my original talk — the whole business about anafunctors — isn’t quite ready for prime-time, and the whole thing hangs together better without it. And this brings up the design philosophy I talked about recently. In this case, writing the smaller paper first is being sort of forced on me by a short deadline. Still, it’s crunch time, and I’m trying to crank this paper out while also teaching, applying for jobs, and dealing with car troubles you wouldn’t even believe. I don’t really feel like working up the next post in the calculus series today, and so I thought I’d toss up an alpha version of the paper. I’ll keep tweaking it, and replacing the version here as I finish more chunks, until I get to a beta version, which I’ll update here and post to the arXiv. One particular note on the incompleteness: I haven’t even started writing the introductory section or the abstract yet. I’m finding that I tend to do better if I just dive into the mathematics and then come back later to say what I said. And finally: it looks like I’ll be talking about this stuff at the University of Pennsylvania on March 19. Mark your calendars! [UPDATE] 02/26: Still sans abstract and intro, but with all mathematical content there, I present a new version. Bibliography suggestions are particularly appreciated (thanks Scott). [UPDATE] 03/04: Now with the abstract and introduction, a beta version. Bibliography suggestions would still be appreciated. There’s a new paper out on the arXiv discussing higher-dimensional linking integrals, by two graduate students at the University of Pennsylvania. I don’t have time to really go through it right now, but at a first scan I’m really not sure what they’ve done here. It seems they’re just taking the regular Gauss integral and doing the exact same thing for higher-dimensional spheres, although in a way that’s so loaded down with notation that it obscures the fact that it’s the exact same idea. Some people like results that are more computationally focused, and some (like me) prefer to lay bare the structure of the concepts, and derive a computational framework later. It may be that these authors are just more the former than the latter. Anyhow, I’m not certain how original it is, but my own work is shot through with “wait, you mean nobody’s written that up yet?” If they’ve found one of these obvious niches that nobody has gotten around to mining, more power to them. The link love just keeps coming! At Secret Blogging Seminar, Scott Morrison makes a plug for the Knot Atlas. It looks like it’s starting with the information from Bar-Natan’s knot table that I’ve linked to before, but now in wiki form. Joy! Okay, after last week’s shake-ups I’m ready to get back into the swing of things. I mentioned yesterday something called the “Temperley-Lieb Category”, and it just so happens we’re right on schedule to explain it properly. We’ve seen the category of braids and how the braided coherence theorem makes it the “free braided monoidal category on one object”. That is, it has exactly the structure needed for a braided monoidal category — no more, no less — and if we pick any object in another such category we get a unique functor from to . Again, we read this from bottom to top, and from left to right. On the bottom line we have a downward line followed by an upward line, which means we start at the object . Then we pass through a cap, which corresponds to the transformation . Then we go through a cup ( ) to get to , and another cup to get to . A cap in the middle ( ) is followed by a cup ( ), and then another pair of caps ( ). Then we have a cup and another to end up at . We could simplify this a bit by cancelling two cup/cap pairs using the equations we imposed on the natural transformations and . In fact, this is probably a much easier way to remember what those equations mean. The equations tell us in algebraic terms that we can cancel off a neighboring cup and cap, while the topology of diagram says that we can straighten out a zig-zag. Incidentally, one feature that’s missing from this diagram is that it’s entirely possible to have an arc (pointing either way) start at the bottom of the diagram and leave at the top. Another useful category is the free monoidal category with duals on a single self-dual object. This is the Temperley-Lieb category which looks just the same as with one crucial difference: since the object is its own dual, we can’t tell the difference between the two different directions a line could go. Up and down are the same thing. In the algebra this might seem a little odd, but in the diagram all it means is we get to drop the little arrows that tell us which way to go. And now if we have any category with duals and any self-dual object we have a unique functor from to sending the strand to . This is how Temperley-Lieb diagrams are turned into (categorified) representations in Khovanov homology. So I’m back from a week in Faro, Portugal, talking about various things surrounding the ideas of “knot homology”. So what is it? Well, this will be a bit of a loose treatment of the subject, and may not be completely on the mark. I like David Corfield’s idea that a mathematician is a sort of storyteller, and I’m not about to let mere history get in the way of a good história. Besides, I’ll get to most of the details in my main line sooner or later. First I should mention the Bracket polynomial and the Jones polynomial. Jones was studying a certain kind of algebra when he realized that the defining relations for these algebras were very much like those of the braid groups. In fact, he was quickly able to use this similarity to assign a Laurent polynomial — one which allows negative powers of the variable — to every knot diagram that didn’t change when two diagrams differed by a Reidemeister move. That is, it was a new invariant of knots. The Jones polynomial came out of nowhere, from the perspective of the day’s knot theorists. And it set the whole field on its ear. From my perspective looking back, there’s a huge schism in knot theory between those who primarily study the geometry and the “classical topology” of the situation and those who primarily study the algebra, combinatorics, and the rising field of “quantum topology”. To be sure there are bridges between the two, some of which I’ll mention later. But the upshot was that the Jones polynomial showed a whole new way of looking at knots and invariants. Immediately in its aftermath a huge number of interpretations and generalizations poured forth. One of the most influential was Louis Kauffman’s “state-sum” model: the Bracket. This is an invariant of regular isotopy instead of ambient isotopy, which basically means we throw out Reidemeister I moves. Meanwhile, I glossed over above that the Jones polynomial actually applies to oriented links, where there’s a little arrow saying “go this way around the loop”. This is a subtle distinction between the Bracket and the Jones polynomial that many authors steamroll over, but I find it important for my own reasons. Anyhow, the Bracket also assigns a Laurent polynomial to every diagram in a way that’s invariant under an apropriate collection of moves. 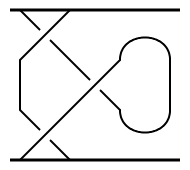 It does this by taking each crossing and “splitting” it in two ways — turning an incoming strand to the left or the right rather than connecting straight across. For a link diagram with crossings there are now “states” of the diagram. Now we assign each diagram a “weight” and just add up the weights for all the different states. Thus: “state-sum”. If we choose the rule for weighting states correctly we can make the resulting polynomial into an invariant. So now we flash forward from the mid-’80s to the late ’90s. Mikhail Khovanov, as a student of Igor Frenkel at Yale, becomes interested in the nascent field of categorification. Particularly, he was interested in categorifying the Lie algebra . That is, he needed to find a category and functors from that category to itself that satisfied certain relations analogous to the defining relations of the Lie algebra structure. He did this using some techniques from a field called “homological algebra”. I’ll eventually talk about it, but for now ask Michi. But as it happens, this Lie algebra has a very nice category of representations. It’s a monoidal category with duals. In fact, every object is its own dual, and we can (morally, at least) build them all from a single fundamental representation. That means that it’s deeply related to the category of so-called “unoriented Temperley-Lieb” diagrams, which is (roughly) to categories with duals as the category of braids is to braided monoidal categories. A Temperley-Lieb diagram is just a bunch of loops and arcs on the plane. The arcs connect marked points at the top and bottom of the diagram (like braid strands) while the loops just sorta float there, and none of the strands cross each other at all. So if there are no arcs, there’s just a bunch of separate loops. And we care about this because the states of a link in the definition of the Bracket are just bunches of separate loops too! So we can take each state and read it in terms of this homological categorification of . And we can read a combination of states — a state sum — in such homological terms as well. So the defining relations of the bracket become “chain homotopies” — natural isomorphisms — in the homological context of the categorification. Thus we have a homological categorification of the Bracket model of the Jones polynomial. And again, it just came out of nowhere and has immediately revolutionized the field. Homology theories are hot right now. This high-level approach has been broken down by Khovanov and Rozansky into a combinatorial formulation, which knot theory groups like those at George Washington University and the University of Iowa have latched onto. The field of “Heegaard Floer homology” has been nudged closer and closer to the combinatorial Khovanov framework from its origins in analytic problems. Other knot invariants are lining up to be categorified along the same lines. And all the while the incredibly rich structure of Khovanov homology itself is being spruced up and neatened, leading to a series of clear examples to act as guideposts for those probing higher categorical structures in general. And that’s what we just spent the last week talking about in Faro. I find myself up earlier than expected this morning, so I thought I’d bang out the proof I’d promised of the “coherence theorem” for braided monoidal categories. Recall that we’re considering a braided monoidal category with underlying “ordinary category” — the same category, just forgetting that it’s braided and monoidal. Then the statement is that the category of braided monoidal functors from to is equivalent to . To make our lives a bit easier, we’ll use the strictification theorem to pass from the (weak) monoidal category to a monoidally equivalent strict monoidal category , with underlying category . Now the braiding on induces (via the equivalence) one on . The new statement is that the category of strictly monoidal functors from to is isomorphic to . Then the result we really want (about ) will follow. One direction is easy: we take a functor and evaluate it at the object to get an object . A monoidal natural transformation has, in particular, the component , which makes “evaluate at ” a functor. For the other direction, we’ll pick an object of and use it to construct a strictly braided monoidal functor from to that sends to , and then show that an arrow in induces a natural transformation between the functors built on and . We’ll see that everything in sight is unique, so this construction actually provides an “on the nose” inverse functor to “evaluate at “. So, we’ve got an object and we set . Then for to be monoidal we must set , since is (remember that the “tensor power” is defined just like regular exponentiation: take the tensor product of copies of the object in question). This completely defines the functor on objects. Now any morphism in is an element of some braid group . Let’s look at simply crossing the left strand over the right in : this is , so to have a strictly braided functor we must set . In , the crossings of one strand over the one to its right generate the whole group. If we cross strand over strand we’ll call the generator . In terms of the category , we can write as , so monoidality forces us to set . We do have to check that the relations of the braid group are satisfied. But if then we have because the monoidal product in is a functor. And we see that because this is exactly an instance of the triangle relation for the braiding on ! So once we pick the single object everything else about is uniquely determined. If we have an arrow then we must set the component of the induced natural transformation to be . Then monoidality forces to be . The construction is indeed a functor sending to the category of strictly monoidal functors from to , and it is clearly inverse to evaluation at .